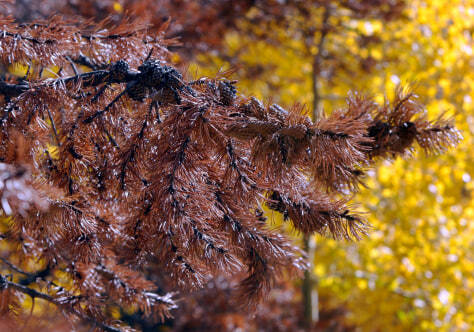 The bough of a pine tree destroyed by pine beetles is shown amid the fall colors of trees near Keystone, Colo., Oct. 1, 2008. There are about 80 mills in North America that produce at least 1 million tons of wood pellets per year. Pellets are made of recycled wood waste such as sawdust or beetle-killed trees.